This guide is intended to help residents take charge of their own energy use. Though this guide may not cover all the big picture changes our energy system needs – community owned clean energy, creative financing, energy billing, and strategic policy changes, or the process of uniting our community around these initiatives- it clarifies and understanding an individual’s own home is the logical place to start playing a role. The overall goal is keeping more of our energy dollars in our pockets and our community so we can be as efficient, active and ready as possible for coordinated action at a larger scale. Please use this energy guide to help save energy yourself, and then join with others across South Minneapolis to engage the neighborhood, create long-term solutions, and build Our Power. While this guide is most appropriate for residential properties, the general principles can also be applied to commercial settings. Commercial buildings will have somewhat similar breakdowns with proportionately smaller heating and cooling costs the larger the building. There are potentially major differences in energy use based on whether the business activity entails computing, cooking, hot water, machinery, or refrigeration. Businesses seeking guidance for saving energy in their specific operations should work with a number of existing commercial energy efficiency programs. This guide is based on a simple premise: In an approach to prioritize the highest-impact energy saving actions upon limited budgets, individual purchases of higher-cost solutions (like solar energy), are considered after implementing the most essential yet accessible, common-sense and low-cost solutions. Starting with the easiest, least costly, and highest-impact activities allows households to recapture a portion of their energy budgets and then invest the savings into the higher and more challenging energy saving solutions. We mention some higher cost options and include clean energy, but only after identifying the most important, common sense, and low-cost actions first. This approach helps residents avoid the common tendency to over-build expensive energy systems because we haven’t addressed the basics of energy usage first. 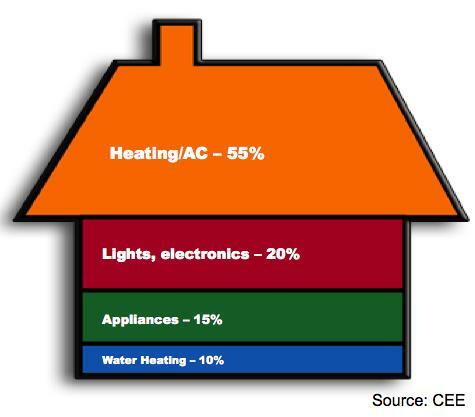 A home uses energy in a number of ways, as shown in the diagram at left (average home for Minnesota). The energy usages in individual homes will vary from larger to smaller depending on several different categories including whether they have air conditioning, how leaky they are, the number of electrical appliances or water usage. This diagram breaks down in rough order the importance of each factor. The following sections outline the major different categories of energy saving actions that one can take but in a logical order of operations. Note that this diagram does not include vehicle use, which varies dramatically based on if and how much you drive, or the energy used in producing food and consumer goods (see the Transportation and Food/ products section at the end).